The stylish Pachmayr Compac Revolver Grips from Lyman have been designed using a specially-formulated black rubber compound for ultimate in comfort and utility. The design helps to reduce recoil that, when combined with the ergonomic notches, provides an excellent and comfortable full-hand experience. The grops have been given an attractive, diamond-plate texture that not only looks great but also provides a secure, non-slip surface. 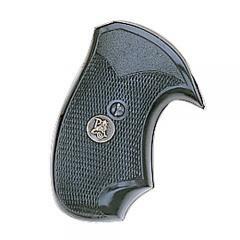 The Compac's small profile and black coloring serve to maintain concealability, making it a great solution for plainclothes officers wanting a well-made item that provides total control while feeling great in the hand. Good price on hard to find item.